It’s the end of an era for the Niagara Parks Commission. The green, black and white People Mover buses that have carried tourists along the Niagara Parkway since 1985 have now been retired. The red, white and blue WEGO buses quietly started rolling along the parkway and across Niagara Falls Monday as the $50 million system made its debut. The NPC and the city called Monday’s start a ‘soft launch’ with an official kickoff event to take place later this month. 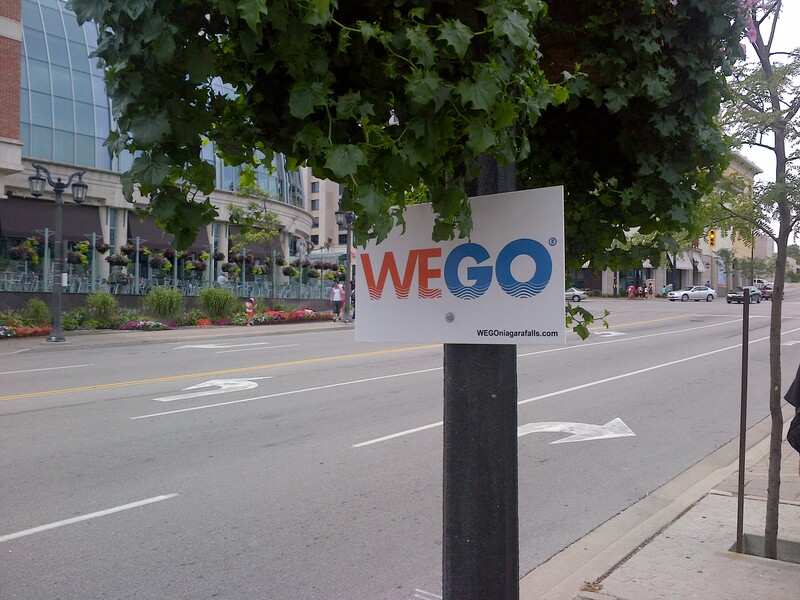 I thought that the WEGO bus system (to replace the People Mover system) was supposed to be starting up soon, so I thought maybe this was a temporary sign, maybe even a temporary bus stop. I went home and checked the website out, and it is a page with ads and a simple search button. It is definitely not affiliated with the city, region, or Niagara Parks. I might have missed it, but I can’t find an “official” web site, and there is no information that I can see on the Niagara Parks or the Niagara Falls Tourism web sites. I don’t know when the new transportation system will be ready to go. UPDATE: So it appears that it was the right site, but it just wasn’t live yet. It’s good that the site is working now, but not a good idea to put the signs out if the site wasn’t live yet. If you visit WEGONiagaraFalls.com you can read about the new transportation service and see schedules/routes. While officials remain relatively tight-lipped about ongoing negotiations for a new people-mover project — which appear to be wrapping up — snippets of information continue to be released, painting a slight picture of how the bus system could operate. An agreement between the City of Niagara Falls and the Niagara Parks Commission to shuttle tourists through some of its respective properties is now before lawyers. Officials are careful not to say anything that could jeopardize what has been a decades-old dream for some politicians and tourism industry stakeholders. But on Wednesday, Niagara Falls Mayor Jim Diodati told The Niagara Falls Review the plan is for the people-mover system to include three routes by 2012, spreading tourists around the city in a “seamless” and “integrated” fashion. A pending deal between the City of Niagara Falls and the Niagara Parks Commission to create a new people-mover bus system to service the millions of visitors to the Honeymoon Capital each year was no shotgun wedding. While Niagara Falls MPP Kim Craitor acknowledges he and Ontario Tourism Minister Michael Chan were asked to help resolve an impasse in negotiations between the parties in recent weeks, the minister did not force a deal on the provincial agency, whose chairwoman Fay Booker continues to raise concerns about the impact the new system could have on Niagara Parks’ revenue stream. “No – I don’t think that’s true,” said Craitor, when asked if the ministry put pressure on Booker and the commission to get the deal done. A $16 million maintenance garage for the future people mover system will be built on Stanley Ave. as the result of a city council vote Monday, though some politicians question why they wouldn’t put it downtown where it might help revitalization efforts. “Not enough was done to see if we could have made that investment downtown,” Coun. Vince Kerrio said. As the city and Niagara Parks Commission move ahead with plans for a new bus system to shuttle passengers around tourism areas, they’ll need a new garage to store and service the 27 buses in the fleet. It will take at least two more meetings for the city and Niagara Parks Commission to work out a deal to jointly run a people mover bus system that will shuttle tourists among Niagara Falls attractions, commission chairwoman Fay Booker says. “We have a draft agreement in front of us we’re working on,” Booker said Friday after meeting with Mayor Ted Salci. They were trying to finalize an agreement in principle they reached in June to run a bus system on roads owned by the parks commission in Queen Victoria Park and on city-owned streets like Clifton Hill and Fallsview Boulevard. “We’re really hoping by early August,” Booker said when asked how long it might take to finalize the rest of the details. he City of Niagara Falls will soon benefit from a new bus system thanks to a joint investment by the Governments of Canada and Ontario, the Honourable Rob Nicholson, P.C., Q.C., Member of Parliament for Niagara Falls, Minister of Justice and Attorney General of Canada, the Honourable George Smitherman, Deputy Premier of Ontario and Minister of Energy and Infrastructure, Kim Craitor, MPP for Niagara Falls, and His Worship Ted Salci, Mayor of Niagara Falls, announced today. A major transportation project that has been stalled for years got a fresh injection of fuel Monday. At a press conference at the Via rail station on Bridge Street, Ontario Deputy Premier George Smitherman announced the province will contribute $25 million toward the development of a new people mover bus system linking the city’s major tourist districts with Niagara Parks Commission properties. The money put up by Queen’s Park matches the $25 million pledged by the federal government in 2003. Smitherman, who is the provincial energy and infrastructure minister, said the time was right for Queen’s Park to “step up to the plate” as an equal partner with Ottawa on the project. “The reality is that until today, the province of Ontario has not been an equal partner with the government of Canada in what is a signature investment here in Niagara Falls,” Smitherman.